I’m thrilled to be Barnesworth Anubis’ prom date this month for the fantastic Collabor88 sale! This month’s theme is Winter’s Edge, a haute punk theme, and Trompe Loeil has put together our Downtown Cathedral Catwalk skybox for all your after-party fashion needs! This skybox has a total footprint of 55m x 55m (removal of the optional privacy sphere makes it 34m x 31m) and features a generously sized tower room in a historic downtown cathedral. Outside snow is blowing through the icicles in front of a backdrop of skyscrapers, but inside the warmth of the spotlights shines down on a concrete slab three-prong catwalk with aged brick and graffiti providing the backdrop for all your fashion photography. Mesh design makes this a lower-prim and better looking – all baked textures and only 91 prims! Mod/Copy/No Transfer. The Downtown Cathedral Catwalk skybox is available during the month of December exclusively at Collabor88! 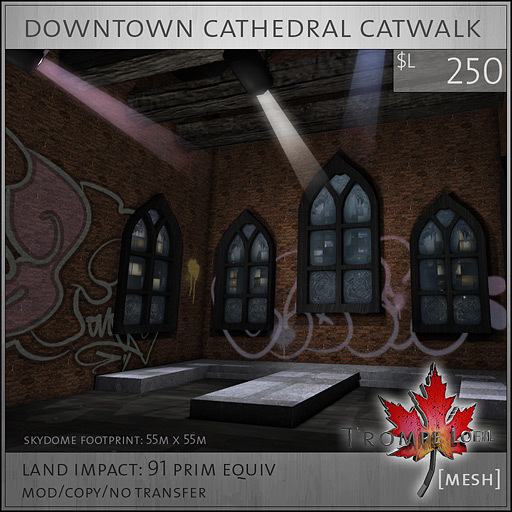 For the entire month, the Downtown Cathedral Catwalk is only $L88! Full-sized model on display there as well. Purchase: available exclusively at Collabor88! The Arctic Cave Skydome for SUYS!